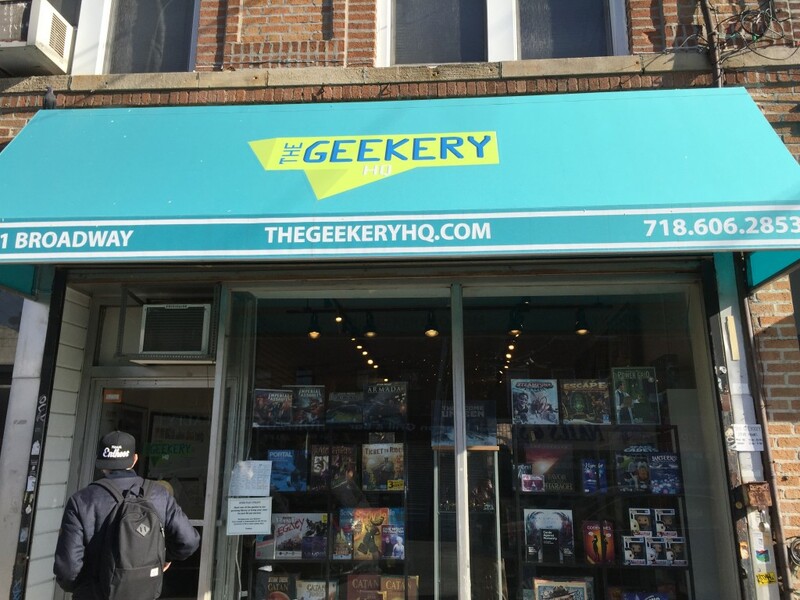 Last Saturday, I played in an Oath of the Gatewatch Sealed PPTQ at The Geekery in Queens. I don’t play Competitve events all that often, so this experience allowed me to think about and see Magic tournaments from a new perspective, and I wanted to share some of those observations with you! The Geekery opened just a few months ago, and although I’d heard a lot of great things about it, I hadn’t yet had time to actually visit. Happily, the venue was as good as everyone said it was: clean, organized, and well-lit. It would have been nice to have more space, but the same could be said for most stores in New York City. The central pathway was wide enough, and the pairing locations convenient enough, that traffic at the beginning of each round wasn’t too bad. Chase Culpon and Chad Horton did a great job as our two judges. This was the first Competitive event I’ve played in about a year, and my first Sealed PPTQ ever. As such, it was also the first time I experienced our new deck registration method from a player’s perspective. Unsurprisingly, this event confirmed for me that the new method is a vast improvement over the old. The person across from me actually opened an Expedition Horizon Canopy, and it was great that he simply knew it was his, rather than feeling bad about passing it to someone else (or having to drop to keep it). That being said, there was a lot more chatter than I had expected during the process — especially when each player opened their own boosters. While most of the comments were harmless, I definitely heard players making random comments about the power level of cards in the pool they were opening or registering. I’m curious if the new method predisposes players to make comments like this, or if it was simply a function of the size/nature of the event. As for the tournament itself, I ended up playing a bunch of good cards with mediocre mana and went 3-3, which was disappointing but perhaps expected. I wanted to stick to two colors, but ended up red-green splashing black for Oblivion Strike and Complete Disregard. Although my rares weren’t great, I did have some powerful and efficient creatures like Mina and Denn, Wildborn, Grove Rumbler, and Embodiment of Fury — as well as Nissa’s Judgment, which is just an insane card. Because I had only one very deep color (green), I made a conscious decision to maximize power rather than consistency. Everyone I talked with at the event agreed that splashing black for the two removal spells was quite correct. Unfortunately, since I was also playing Mirrorpool, Sea Gate Wreckage, and 1-2 Wastes, I was effectively four colors. To make matters worse I had no fixing apart from two red/black dual lands. I lost round 1, putting up a valiant fight against a very bomb-heavy deck with Kiora, Endbringer, Woodland Wanderer, and a strong cast of supporting characters. (I did win one game through a resolved Kiora after mulliganing to 5, though, so that was exciting.) 0-1. I won round 2 against a U/R/G deck. Games 1 and 2 were both very close to non-games, as the two of us alternated mana troubles and got run over. Game 3 I boarded all my red cards out for white ones, and overpowered him with an Affa Protector that picked up a few counters and a very angry Plains (courtesy of Ondu Rising). Nissa’s Judgment helped — a lot. 1-1. Round three began with my opponent telling me his deck was terrible and he nearly dropped after going 1-1. Needless to say he crushed me in two games. In our second game he curved Eldrazi Skyspawner into Reality Smasher. I didn’t have a removal spell and promptly found myself pledging my eternal allegiance to Kozilek. 1-2. Round four I played against a very cool Bant Eldrazi deck. I won game one off the back of Nissa’s Judgment (no surprise there). I nearly won game two, knocking him down to six life, before he cast an Eldrazi Displacer to effectively prevent me from attacking. Game three went even worse for me as he assembled a virtual lock with Eldrazi Displacer, Void Grafter, and Birthing Hulk. 1-3. Round five my opponent didn’t show up for a few minutes, then eventually dropped by to say “oh yeah, I’m dropping.” I won! 2-3. Round six I played creatures, turned them sideways, and claimed victory in two games. 3-3. From a judge perspective, the most interesting situation occurred in round six. My opponent decided to board out one of his colors and completely change his deck. However, it took him something like eight minutes to do this (including de-sleeving and re-sleeving many cards, and getting up to grab new basic lands). Although this is a clear instance of Slow Play, I consciously decided not to call for a judge. My reasoning was that, since this was a local event where many of the players knew me, I wanted to preserve my reputation as a “nice player” rather than risk being seen as a shark. Apart from the Slow Play situation, the other big issue I wrestled with during this event was tilt. I am very much a Spike, and this gets amplified when I play Qualifier events because I attend them so rarely; I want to make each one count. At the same time, I also want to have fun, and I want those around me to have fun — or at least think of me as pleasant to play against. I think it’s important to realize that tilt is rarely a “zero to eleven” process, but something that adds up over time. That being said, it really surprised me was how quickly various small frustrations compounded upon each other. I didn’t go on tilt during deck registration when that guy across from me opened an Expedition during deck registration (damn, that could have been me). Nor during deck build, when I realized that I couldn’t wring 22 good cards in just two colors from my pool (I know how this format works, why can’t I just open good cards?). But during round one, when I got steam-rolled by a bunch of rares? Or during round three, when my opponent complained about how bad his deck was and crushed me anyway? On the negative side, I don’t like putting myself in situations where I feel like I have to actively restrain myself from inflicting hostile feelings on people around me. I am not (yet) at a point where I can genuinely laugh off defeat and keep on smiling. So while I absolutely learned a ton from spending a day in a player’s shoes, I’m not exactly chomping at the bit to play another Competitive event anytime soon. That being said, I also believe that the ability to handle frustration is like a muscle. Some of us might be naturally better at laughing off the bad beats: more good-natured, perhaps, or just more mature. For the rest of us, shaking off tilt is a skill — a mindset — that takes work to develop. And I can say that it’s something I’m going to be much more mindful of moving forward, and looking forward to improving. On the subject of tilt, for me it’s been a matter of just learning to not be results-oriented in my thinking about playing Magic; finding value in interacting with the people across from/around me, and simply in the act of playing the game. Puzzling out the best path with the resources I have, rather than getting frustrated with the ethereal circumstances of what might have been, has made a big difference in my ability to engage productively. I had a similar issue where I was playing a match and my opponent received strategic advice from a player in another match. I could’ve called a judge over for Outside Assistance, but I chose not to. I just got done explaining to my opponent why he missed a trigger and I didn’t want to be obnoxious with my rules knowledge. 8 minutes is a bit much. I would have involved a judge because that player needs to be made aware and educated (by an official) that his use of time is inappropriate and carries consequences (like a Warning for Slow Play). Otherwise, he might do it again. Yes, I feel like the new method predisposes players to this. If you and I are across from each other, and you are opening your packs for me to review them, then I have nothing to actually do (just observe). If I’m bored or antsy, I might start making comments. Another factor is that the new method has far more interaction between you and I, so it feels like we’re doing this together. In the old method, there was little interaction. That means I’m more likely to congratulate you on an expedition, or commiserate with you if I opened 6 powerful mythics and you opened 3 “Oath’s” and a Call of the Gatewatch. I try not to bring my judge status into the equation while I’m playing. It’s fine for those to be separate things–I think people can accept that I’m a spike when playing, and a good judge while judging. That’s also why I can’t stand judging & playing at the same time–I hate dealing with that tension. But Bearz, if you don’t use your judge playmat you won’t get that added intimidation factor…. I agree with both of you that judge status shouldn’t factor into the equation, but when you’re in the position of playing in an event that you’re not judging, you can still use what you know and make decisions based on that. You don’t need to be a judge to understand the rules or tournament policy; you know it that well because you’re asked to know it as a judge. In your scenario, a player that isn’t a judge could understand that this is Slow Play, and call a judge based on that. Anyone can consider the implications of tournament pacing that Riki talked about, but we don’t require players to point out Slow Play when they think they see it (else they may feel pressured to call judges more often, which leads to its own set of problems). There’s also a number of other factors to be considered, as you mentioned, but as a player you have reasonable expectations on the pacing of the tournament. I think most people aren’t going to think you’re petty for that kind of situation. Some might, but you can’t please everybody. I don’t think you did a wrong thing. Like I said earlier, you as a player aren’t required to point out Slow Play, but you as a judge know more about what should happen (which is something anyone can know). Acting on said information without bringing your judge status into it is perfectly fine.